These free sewing patterns for men's boxers will get you started making great gifts for the guys in your life. Choose an easy-to-wash soft fabric and see how fast those boxers become his favorite. Boxers are not just for the guys; many young ladies love to sleep in boxers and a tee shirt. One thing to be aware of with all of these patterns is the type of elastic you should use. Learn how to use sewing elastic before you buy the wrong type. This free pattern makes a standard pair of boxers with a fly front. 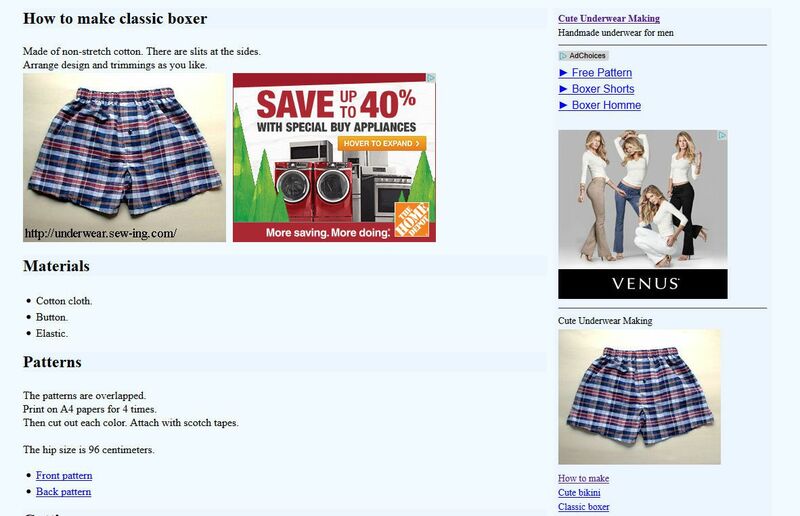 There are excellent directions with many graphics to explain the process so anyone can make these boxers. The printout of the pattern is for 96 cm hips and would have to be altered for other sizes. This free pattern is designed for stretch fabric so lightweight knits and fleece boxers would be great for this pattern. This one does not feature a fly front so the girls would really like it! These adorable boys boxers for boys five to six years old look so comfy! The free directions are photo enhanced so anyone should be able to follow along if you take their time. These soft briefs for little boys would make a great potty training reward. Using soft stretch cotton fabric with a novelty print would make them extra special! Judging by the design of the front pattern piece, which seems to have a pouch style area in these simple bikini underwear pattern, the guys that prefer bikini style underwear should love these! When guys have their favorites and you simply can't seem to replace them, the best solution is to follow these instructions to un-sew their favorite pair and make a new one. There are also many more included that are bound to become the new all-time favorites. Seams can be uncomfortable when they land in the wrong location. This pattern for men's bikini underwear solves this problem by having no seams in the front piece. These instructions have many photos to guide you through the process of making your own men's bikinis. This printable pattern is for sizes XS to XL. The pockets could easily be removed for more of an underwear type garment, but the pockets make this boxer pattern a perfect one to use for making sleepwear style boxers or elastic waisted shorts style boxers. This free pattern is a PDF printout, so the printing should be very accurate for sizing purposes. While it doesn't come with instructions, if you are experienced in sewing, you should be able to put the pieces together pretty easily. It creates a great pair of button-closed fly-front boxers suitable for guys or gals.